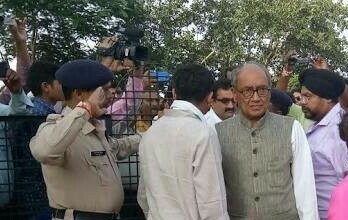 In a surprise move, senior Congress leader and ex-chief minister Digvijay Singh met Narmada Bachao Andolan (NBA) leader Medha Patkar in Dhar jail, Madhya Pradesh, describing her as a "great social worker who has dedicated her entire life to fight for the cause of Narmada dam affected people of the state." Singh's move comes amidst the Congress high command wary of aligning itself with Patkar or NBA because of the sensitivity involved on Narmada dam in Gujarat, which goes to polls this December. Even though the Narmada dam oustees' problem is politically sensitive in Madhya Pradesh, the BJP is steadfastly taking the view that all of them have have been resettled, which is seen as a support to the BJP in Gujarat ahead of the polls. Meanwhile, in two of the three cases -- pertaining to assault or criminal force to deter public servant from discharge of duty (Section 353 of IPC) -- instituted against her, the local court granted Patkar bail. NBA now plans to move the Madhya Pradesh High Court over refusal to grant her bail in the third case, regarding alleged kidnapping of revenue department staff by the NBA activists (Section 365 of IPC) on August 1. Coming out of the jail, Singh told reporters that the FIRs in the cases in which Patkar has been arrested don’t even bear her name, but still, warrant was issued against her. “She has been arrested for alleged kidnapping of government staff, despite the concerned government official telling the Dhar district collector over the phone that he wasn’t kidnapped,” he said. The day Patkar and others broke their 17 day indefinite fast on August 12, the Madhya Pradesh police foisted cases of disturbing peace, kidnapping and charges on 55 named and 2,500 unnamed NBA activists and its supporters. An NBA source said, most of the cases are related to the incident on August 7 when 2,000 strong police force "violently attacked the fasting protesters, injured 42 and forcibly hospitalised 10 of them in Dhar and Indore Hospitals." Patkar and her supporters, Dhurji Bhai, Vijay Bhai and Santu Bhai, have completed five days in different jails following their last arrest. NBA says, "All these fabricated cases have been imposed so that movement against the illegal and unjust forced eviction of 40,000 families in the Narmada Valley can be crushed." In a statement, NBA says, "Police vehicles are roaming around the villages all day and is creating fear in the minds of people", adding, "According to the compiled information, FIRs have been registered against 72 people in 9 cases in Barwani, and FIRs have been filed against 94 people in 12 cases in Kukshi, District Dhar. There are also many other serious charges and non-bailable warrants pending." "Today, the world recognizes the 32 years of non-violent struggle and Satyagraha of NBA. But the Madhya Pradesh Police, at the behest of the Government, is charging them in cases, such as under section 307, accusing them of being involved in murder and kidnapping", the statement alleges. Nurtured for centuries are destroyed forcibly/ Can we be proud of such independence? ", insisting, "We shall fight, we shall win!"